RESPONSIBLE RESEARCH AND INNOVATION: A NECCESITY FOR SCIENCE? – Politics, Perception, Philosophy. And Physics. RESPONSIBLE RESEARCH AND INNOVATION: A NECCESITY FOR SCIENCE? Research within science is often done to benefit society. Sometimes, however, research is done without forethought to the possible consequences. 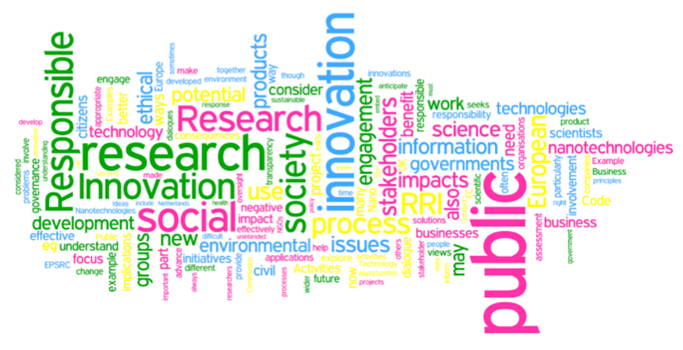 Is responsible research and innovation (RRI) a possible solution? Responsible research and innovation (RRI) is not a new concept.Significant development of RRI has only recently, within the last few years, been explored within the EU . Because the discussion surrounding RRI is so recent an established definition is not available. However, the general concept is that there should be a responsibility on science and technology researchers to help achieve social or environmental benefits, whilst also considering the future positive and negative impacts of their research. This is particularly applicable to nanotechnologies, genomics, synthetic biology and geoengineering, due to the possible safety risks involved in these emerging technologies. RRI is a much broader issue than these particular sub-fields, however. For example, EPSRC is investigating how they can embed responsible innovation into their funding schemes . Another aspect of RRI is to create a stronger link between the public and science. It has been suggested to do this through greater transparency on what is being researched and also more engagement with the public. The obvious reason for RRI to be employed is the risks posed by certain areas of research. In the past, technologies such as asbestos, CFCs etc have shown to be large problems in terms of their safety to the general public as well as their damage to the environment. By applying RRI the idea is that these negative implications would be dealt with before research into new technologies is even carried out, both saving time and preventing unintended consequences. In a related point, RRI would also allow research into the most beneficial technologies for current global issues to be a priority. This could allow specific areas of research to be highlighted for the benefit of society such as fuel cell science or forms of renewable energy and carbon capture . This won’t just benefit society as a whole but also could help stimulate certain areas of research and thus strengthen scientific research, by giving more of a political mandate, as the areas of research would be chosen via public institutions. This leads onto the final advantage, restoring faith in the government. Although that may not sound like an advantage to many it most certainly is for research science. With a lack of public trust in government it leads to a lack of public trust into where government is investing its money, i.e. research science. Using RRI to engage with the public and show that plenty of thought has been put into where their hard earned taxes are going, allows a level of confidence in the research, as well as allowing a greater understanding of the research. This could result in not just research benefiting but also in inspiring many of the public to get more involved in the development of innovation in science. How would RRI be implemented? No set structure for RRI has been set yet and development is definitely still an ongoing process. A major attempt at setting a framework has, however, been accomplished. In 2011 a ‘stage-gate’ review was set up for the Stratospheric Particle Injection for Climate Engineering (SPICE) project. ‘Stage-gating’ is used to split research and development into specific stages. In this situation one of these gates was the decision gate where the continuation of the research would occur when criteria were fulfilled (social, environmental and technical). A panel of relevant experts, ranging from a social scientist to an aerospace engineer, was compiled to develop this ‘stage-gate’. The criteria that had to be fulfilled, , included identifying risks, complying with government regulations, communicating the reasons for the project to stakeholders (people and organisations affected by the research), reflecting on the applications and impacts that the research could create in the future, i.e. a much broader vision of the project’s possibilities, and attempting to understand stakeholder’s views on the research.. The SPICE project case study, however, shows one of the possible major flaws that RRI would impose upon research scientists: the amount of added work to starting up any new field of research would be huge. Out of the five criteria outlined for the stage-gate only two of them were deemed successfully achieved by the independent panel and those were the initial risk assessment and compliancewith the already-in-place government regulations. The other three still required work and thus the project was postponed. From a scientist’s point of view this type of process would be extremely frustrating considering the fact that applying for a research grant from the EPSRC already requires a 34 page guide . Another, perhaps more left-field, disadvantage of RRI is what it could mean for traditional science. As in the science for science sake; this type of research is very hard to justify in terms of its short-term benefits to society or the environment as a whole as it is done simply because “it is there”, rather than to solve a problem. This would mean any RRI applied to the distribution of funding would probably dismiss such blue-skies research. this in turn could cause a lack of fundamental theories being produced and thus science being less innovative as it will be constrained to the only the fundamental theory we have already discovered. Going over the respective arguments for both sides it seems as though ethically and morally RRI would be the correct thing to do: Why should research science be free of scrutiny? However it seems that current solutions would harm research and innovation due to their bureaucratic nature and rigidness to develop in areas for which we have no understanding of. So it seems that RRI shall require more thought into how it can be applied before it can truly be instigated into the various research councils funding requirements. Owen, R., P. Macnaghten, and J. Stilgoe, Responsible research and innovation: From science in society to science for society, with society. Science and Public Policy, 2012. 39(6): p. 751-760. Stilgoe, J., R. Owen, and P. Macnaghten, Developing a framework for responsible innovation. Research Policy, 2013. 42(9): p. 1568-1580. Sutcliffe, H. and M. Director, A report on responsible research & innovation. EPSRC, Funding Guide – Arrangements and procedures for research grants and research fellowships. 2014, EPSRC: Polaris House, Swindon.